We’ve previously looked at Warren Buffett’s letters that cover 2015, 2014, 2013, 2012, 2011, 2010, 2009 and 2008. Today we’ll examine the 2016 letter, which was published over the weekend. As usual, I’ll try not to repeat everything that we’ve come across before – there is usually a lot of overlap between the letters. 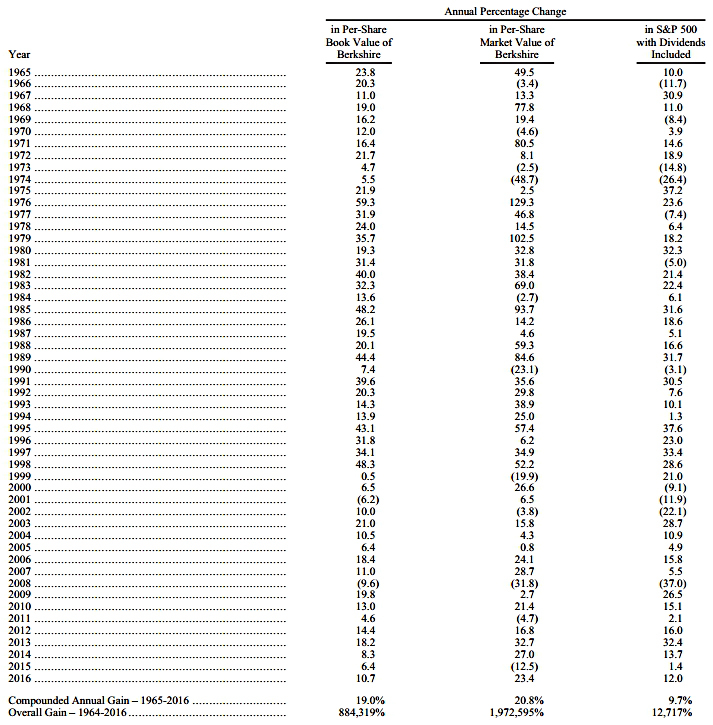 In 2016, the increase in BH book value was 10.7%, slightly lower than the S&P 500’s 12% gain. The BH share price increased by 23.4%, well ahead of the index. The 10.7% gain in net worth added up to $27.5 bn. This is why BH repurchases shares when they are priced below 120% of book value (rather than at less than 100% of book). This clear signalling has tended to mean that BH shares trade higher than 120% of book and few repurchases are made. Warren criticised other firms for not indicating a price above which repurchases will be avoided. Charlie and I have no magic plan to add earnings except to dream big and to be prepared mentally and financially. Every decade or so, dark clouds will fill the economic skies, and they will briefly rain gold. It’s imperative that we rush outdoors carrying washtubs, not teaspoons. Warren has learned the hard way about making purchases with valuable BH stock. Warren gives his usual thanks for “America’s economic dynamism”. Babies born in America today are the luckiest crop in history. He also warned against panicking during the next (and inevitable) crash. widespread fear is your friend as an investor, personal fear is your enemy. As always, Warren talked about BH’s increasing float (premiums pay in advance of future claims). This accounting problem is the biggest cause of the gap between BH’s book value and its intrinsic value. Warren still expects the float to shrink gradually in the future because of run-off contracts in National Indemnity’s reinsurance division. BH has now achieved an underwriting profit for 14 consecutive years, with total pre-tax gains of $28 bn. GEICO’s low cost base provides an enduring moat that means that market share increases each year. GEICO now has around 12% of the US auto-insurance market. That’s up from 2.5% in 1995, the year Berkshire acquired control. BNSF’s revenue per ton-mile was 3¢, while shipping costs for customers of the other four major US railroads ranged from 4¢ to 5¢ (BNSF is the low-cost provider). This set of businesses earned 24% after tax on $24 bn of net tangible assets. the full amortization of certain intangibles over periods averaging about 19 years. In our opinion, most of those amortization “expenses” are not truly an economic cost. the 2016 amortization charge to GAAP earnings was $1.5 billion. My judgment is that about 20% of the 2016 charge is a “real” cost. depreciation charges are necessarily based on historical cost. Yet in certain cases, those charges materially understate true economic costs. 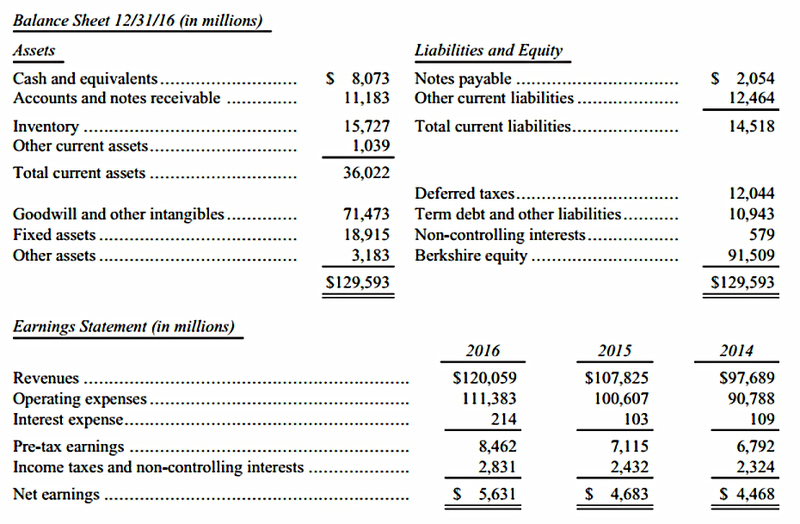 At BNSF, our GAAP depreciation charge last year was $2.1 billion. But were we to spend that sum and no more annually, our railroad would soon deteriorate and become less competitive. 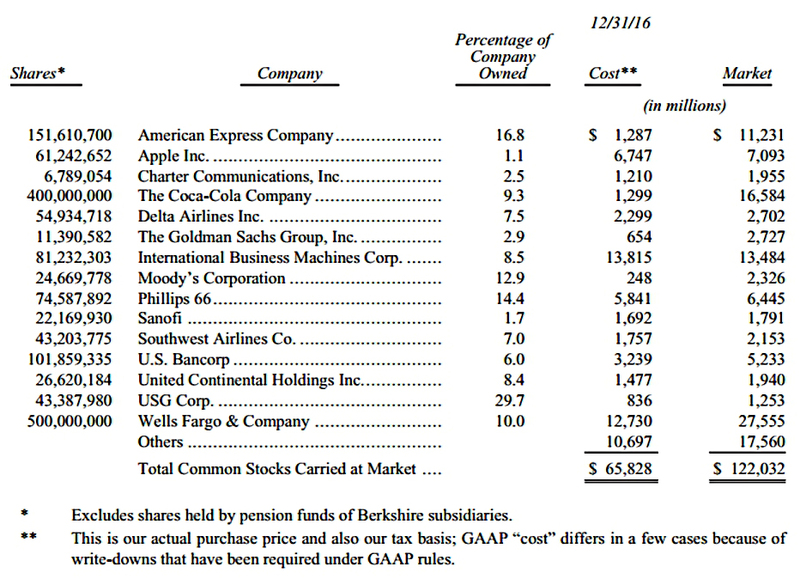 are looking for any means to feature “adjusted earnings” that are higher than their company’s GAAP earnings. Two of their favorite ways are the omission of “restructuring costs” and “stock-based compensation” as expenses. CEOs who overtly look for ways to report high numbers tend to foster a culture in which subordinates strive to be “helpful” as well. Clayton Homes sells “manufactured homes” (pre-fabs) to low-income customers, and provides mortgages against these homes. Clayton’s recent earnings have been boosted by low interest rates. For some firms this would be a risky approach. But as part of BH, which would benefit from higher interest rates, it is safe. The Kraft Heinz holding is excluded from the list above because BH is part of the “control group”. The year end market value was $28.4 bn. The cost of the shares was $9.8 bn. Pension investments are also excluded from the table. 95% of the $86 bn of “cash and equivalents” is in the US and not subject to repatriation tax. 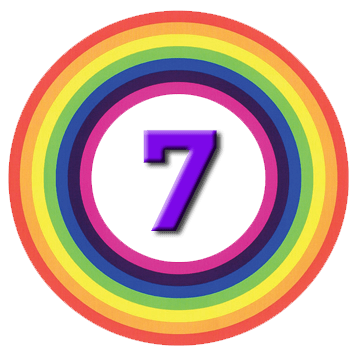 BH also has the option (via a holding of preferred stock) to buy 700M shares of Bank of America at any time prior to September 2021 for $5 bn; as these are currently worth $11.8bn, the option is likely to be taken up just before expiration in 2021. If the dividend on Bank of America common stock ­ (currently 30 cents pa) increases to 44 cents pa before 2021, Warren would instead make a “cashless exchange of our preferred into common”. 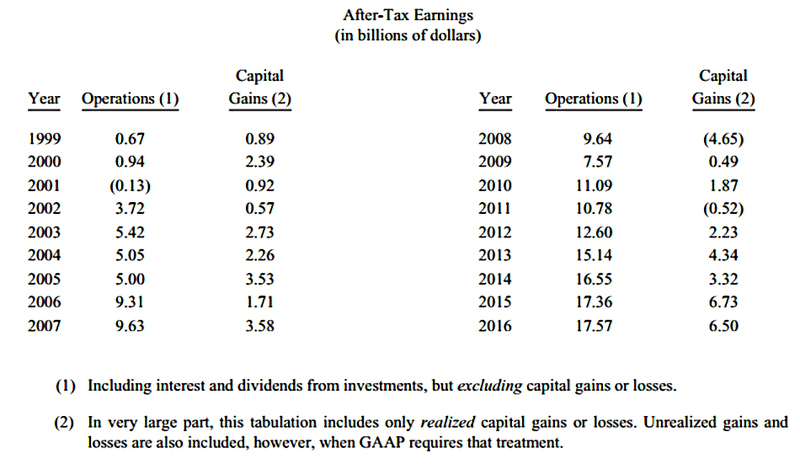 Warren also pointed out in this section that dividends from holdings to the parent BH are more tax efficient than capital gains. The next section of the report is about Warren’s famous bet that the S&P 500 would outperform hedge funds over 10 years. “Proposers” post a proposition that will be proved right or wrong at a distant date. “Doubters” take the other side of the bet. Each side names a charity that will be the beneficiary if it wins and gives its wager to Long Bets. Participants also post a short essay defending their position. When the bet concludes, Long Bets pays off the winning charity. Warren’s bet dates back to the 2005 report. He said that passive investing in the S&P 500 (via a low-cost Vanguard fund) would outperform active investment (specifically a set of “fund of funds” – style hedge funds) because of the fees involved in the latter. He then put up $500K to back his claim over a 10-year period. Eventually Ted Seides of Protégé Partners took the challenge. It’s pretty obvious that Warren is going to win. I estimate that over the nine-year period roughly 60% ­- gulp! -­ of all gains achieved by the five funds-of-funds were diverted to the two levels of managers. the great majority of managers who attempt to over-perform will fail. most managers seek new money because the more funds they have under management, the greater their fees. My calculation is that the search by the elite for superior investment advice has caused it, in aggregate, to waste more than $100 billion over the past decade. Human behavior won’t change. Wealthy individuals, pension funds, endowments and the like will continue to feel they deserve something “extra” in investment advice. It’s another quiet letter this year, I’m afraid, with the main focus the bet on the S&P 500 outperforming the hedge funds. Strange that he didn’t leave it until next year, when the ten years is up. There was nothing about the macro events of 2016 – Brexit, Trump (Warren backed Clinton), the potential break-up of the Eurozone – and almost nothing about what the potential for rising interest rates could mean. We learned that the pain to Clayton Homes would be exceeded by the benefits to the rest of BH. As with last year, there was nothing about commodities (oil or gold). As always, Warren remains convinced that America’s best days lie ahead. Last year’s live streaming of the Annual Meeting was deemed a success and will be repeated in May. They are sticking with Yahoo, despite its demise as an independent company. Let me know if you spotted any gems that passed me by.